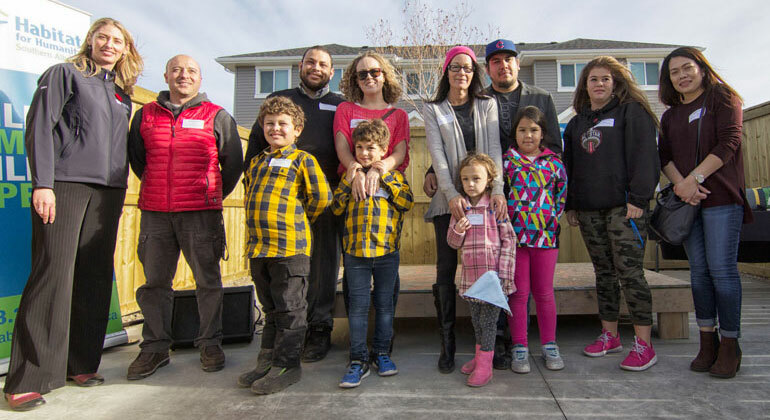 Habitat for Humanity welcomed six families into home ownership last week at a ceremony in the community of Ravenswood in Airdrie. In attendance were many of the sponsors, suppliers, trades, and community partners who contributed to make home ownership a reality for these six families. Airdrie Mayor Peter Brown and Blake Richards, MP Banff-Airdrie, were in attendance to welcome these six families into their new homes and offer their support. These six families, 11 parents and 14 children, will all purchase and move into their new Habitat homes by the end of November. Habitat homes are truly a labour of love, built with a tremendous amount of support from the community. The Government of Alberta, Qualico Communities, Genworth Canada and FortisAlberta have all been generous supporters of these homes in Airdrie, along with many local trades and suppliers that donate building materials and labour to make home ownership possible for families. “Qualico Communities has been working with Habitat for Humanity for many years to give a hand-up to families, and we’re excited and thankful to be part of it,” said Cheryl Heilman, Marketing Manager of Qualico Communities. These six homes are part of several developments Habitat is currently working on. Other projects include 24 homes in Pineridge, two homes in Redstone, five homes in Bowness and several upcoming developments in Calgary and across southern Alberta.